Anything with sprinkles in or on it reminds me of my childhood. One of my favourite treats while growing up were any type of cookie. 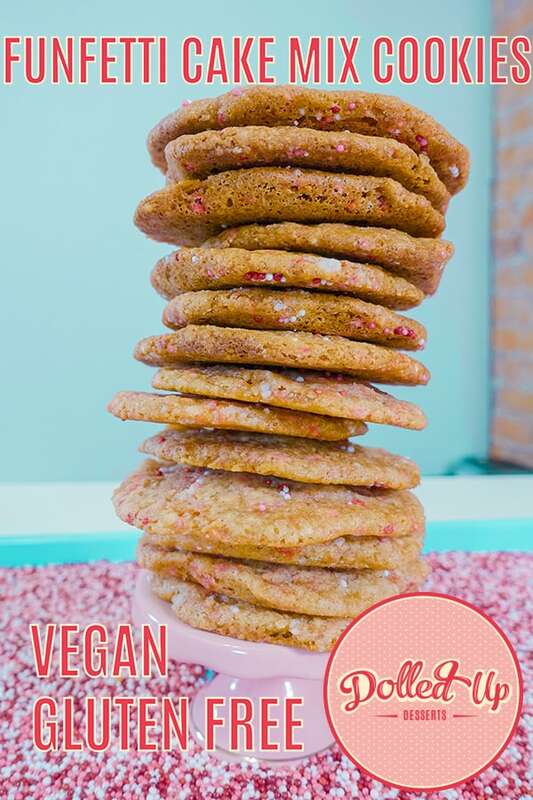 I wanted to create the ultimate throwback to life before adulting by combining sprinkles and cookies, but also wanted to add my own now-adult flare to the recipe. I decided funfetti cake crumb cookies would be a great idea and give my tastebuds the nostalgia they’ve been looking for. 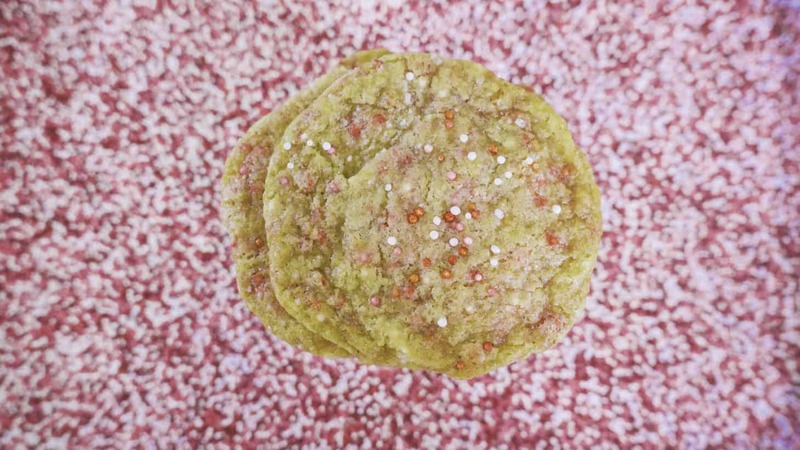 These cookies were inspired by our Milk Bar Confetti cake recipe , and are as much of a feast for the eyes as much as they are delicious to eat as well. 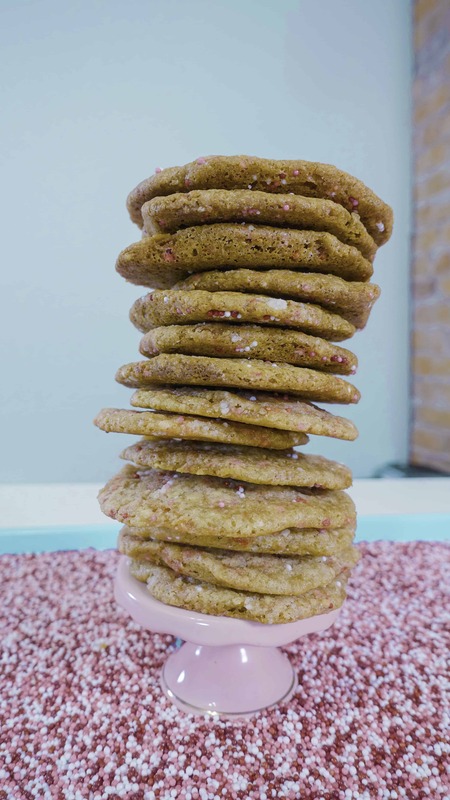 Plus, we all know about how much I love Christina Tosi, so I wanted to put my spin on her classic recipe… And pink sprinkles. It’s Dolled Up Desserts. We love pink sprinkles. So, if you like cookies as much as I do, these are a must-try treat for any home baker and anyone who enjoys #inclusivedesserts. Funfetti Cookies filled with the classic Milk Bar inspired cake crumb. In a large bowl, put in melted coconut oil and add in clear vanilla extract. Add in 1/2 cup of sugar, 2 tbsp brown sugar and 3/4 cup of all-purpose gluten free flour. Add desired amount of sprinkles to ingredients and mix to form a crumbly dough. Pour crumbly mixture onto a baking sheet. Spread evenly and bake for 20 mins at 300 F flipping the crumbs halfway. In a large bowl mix equal parts sunflower oil and equal parts apple sauce. Add 1 tbsp of clear Vanilla extract. Add in Dolled Up Desserts Cloud Nine Vanilla Cake mix and mix together to form a dough. Add in desired amount of sprinkles and mix. Take a small, golf ball sized amount of dough and flatten to form a pancake-like shape and width. Put cake crumb in the middle of your cookie, and fold together to make another ball with cake crumb inside. Press cookies down onto a parchment lined baking sheet and bake at 350 for approximately 10-12 minutes.